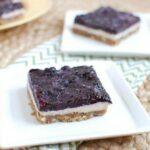 These Blueberry Cashew Bars are a simple, frozen summer treat that are packed with healthy fats and antioxidants! I have a confession. I made these Blueberry Cashew Bars a few weeks ago, photographed them and then stuck them in the freezer and promptly forgot about them! Whoops! The good news is, I was cleaning out the freezer the other day and I found them…then- lightbulb!- realized I never shared them on the blog. So here we are. Then, I almost couldn’t share them today because I upgraded my computer software yesterday (scariest thing ever) and I had to work out some kinks with iphoto (all the while patiently not freaking out!). But, I got all that taken care of and I’m here to share this little frozen treat with you today! I came up with these while looking for a way to use a random bag of cashews I bought a couple of months ago. I like cashews but don’t typically eat them just by themselves. I also had some extra wild blueberries after making these Wild Blueberry Ice Cream Sandwiches, so I did some googling and came across these and decided to try my own spin. This was my first time soaking cashews to make any sort of filling, although I know it’s quite common. I’ll definitely be doing it again, though, because it worked quite well! Hubby thought I was crazy, but I persevered! A fun, frozen treat for summer! Place cashews in a bowl, cover with water and soak at least 4 hours or overnight. Drain water from cashews and place in a high powered blender or food processor with nut butter, vanilla, honey and milk. Place the almonds and dates in the food processor or blender and process until well combined. Press the date mixture into the bottom of a 9×9 pan. Top with cashew mixture and spread to make an even layer. Place in the freezer for 30 min. Meanwhile, combine blueberries, honey and chia seeds in a small saucepan. Bring to a boil, then reduce heat and let simmer for 10 minutes, using a fork or spatula to smash blueberries. 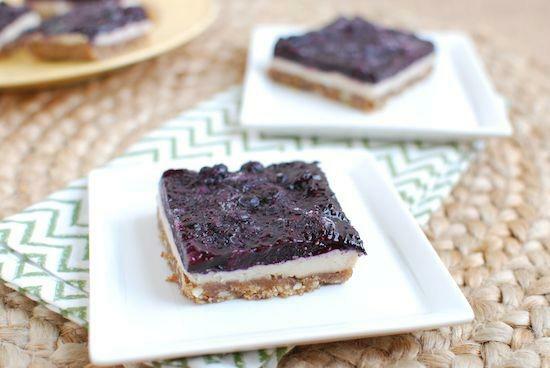 Remove bars from freezer, spread blueberry layer on top and refreeze until solid. To serve, remove from freezer and let sit 10-15 minutes before cutting into squares. 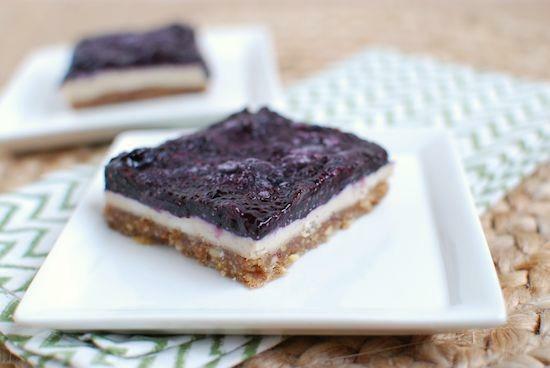 I think you could use regular blueberries to make these, you just might have to do a bit more smashing of the chia jam mixture for the top layer. Other fruits like blackberries, strawberries and raspberries would work well too! This is kind of a taste as you go along recipe. For the cashew layer, start with 1 tablespoon of honey and taste after blending. If it’s not sweet enough for you, add a little more! I used peanut butter because I love the taste of blueberries and pb together. If you want a more subtle peanut butter flavor, decrease to 1/4 cup instead of 1/3. These look so delicious! I’ve yet to use raw cashews before, but I’m always tantalized by how creamy they look when they’re blended! these look great! i need to make them!!! you never know. these were surprisingly easy to make look pretty! I am glad you found them and shared them with us, i must say the pictures look beautiful. Linds…this looks delicious. I wonder what other gems you’ll find your fridge/freezer/cat food drawer now. Love this! Cashews are my favorite but and I eat em like candy 😛 And I have been loving the summer blueberries like crazy too! These sound fantastic! And I have some cashews in need of use. Perfect for blueberry season, too! Woah–this look fabulous. Love every part! I just need to buy some more cashews. I love using cashews like this. They are amazingly versatile. Thanks for sharing this one! These sounds amazing!!! I love that they can be made vegan too!!! I keep seeing recipes with soaked cashews! It’s about time I try them myself! I went to a raw cooking class a couple years ago and it is amazing the different sauces, etc that you can make with nuts. These sound delicious. I’m just amazed that you could make them and forget about them! I love the beautiful layers in this dessert. I’ve only started to soak cashews for desserts, and I’m loving it! They look fantastic, Lindsay- glad you rediscovered them. 🙂 Have a great weekend! Yum! 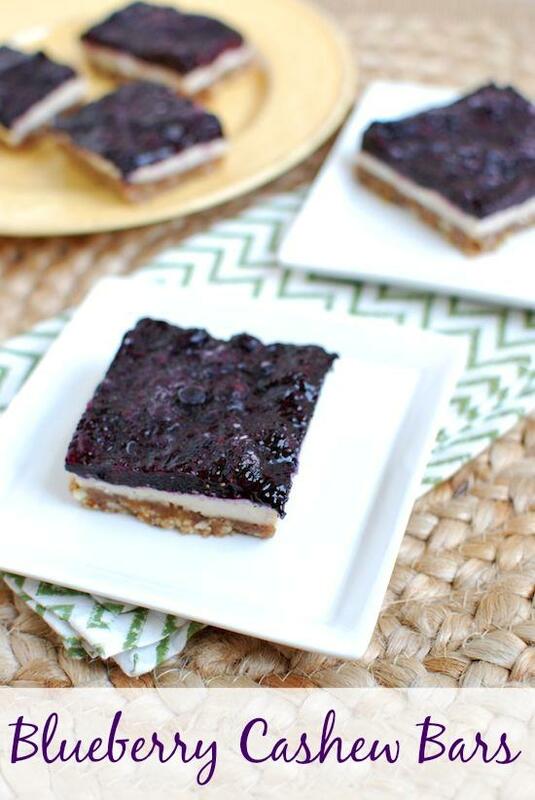 I have been on a major blueberry kick lately so these look extra good today! yum! that will be delicious! A local market sells 10lb boxes of MI blueberries…I’m overdue to buy a box. yes! i do the same at my market. can’t wait! These look yummy! I’ve never soaked cashews either but I’ve got a random bag too, I’ll have to give it a whirl. ooo… these look delicious! i haven’t used cashews much for “cremes”, but this looks like a great place to start. I have a bag of dates that I need to use up, so these would be great for that! They look fantastic! And I did the whole software update a couple months ago, and nearly had a heart attack waiting for the iPhoto kinks to work out. So stressful! Hope all has worked out! Oh I need to make these! These look amazing, Linds!! I looove blueberry + peanut butter. I haven’t tried soaking cashews yet either! I’ve heard it’s wonderful! it’s definitely worth a try! so versatile too! Awesome that you gave cashews a little love… they’re sadly underused in the dessert world 🙁 Looks yummy! agreed. but i’m loving them. need to buy more so i can create something else! Wow, these sound really interesting for a healthier treat! Just LOVE frozen bars … bet it was the tastiest surprise you’ve had in a while! haha the sneaky top drawer of the freezer gets me every time! Ooh, those looks so good!! And I can have all of the ingredients, too, no small feat! These look amazing!! Pinning to make later today or this week… once I stock up on cashews! hi lindsay! i made these bars over the weekend and my boyfriend and i loved them. i also loved that they turned out as pretty as yours! do you have any idea on the nutritional facts for the recipe or per bar? or a site that would help me figure this out? i tried to input it into dailyplate.com but don’t think it was very accurate. thanks! Glad you liked them! You could try going to my fitness pal and using their recipe calculator. I think they’ve updated it now so you can just put in the url for the recipe and it can pull most of the ingredients! These are amazing! Such a delicious and healthy sweet treat! I have eaten these frozen, refrigerated, or slightly warm- all good! I love that these are dairy free and gluten free! This is a keeper for sure! Thanks for sharing! [WORDPRESS HASHCASH] The comment’s server IP (66.155.8.241) doesn’t match the comment’s URL host IP (192.0.80.250) and so is spam. [WORDPRESS HASHCASH] The comment’s server IP (108.163.215.202) doesn’t match the comment’s URL host IP (185.56.85.159) and so is spam.